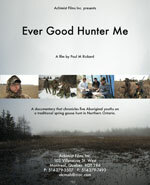 Ever Good Hunter Me is a documentary that chronicles five Aboriginal youth on a traditional Cree spring goose hunt in Northern Ontario. The film follows filmmaker Paul Rickard's four nephews and niece over the course of a week as they learn the importance of the hunt, overcome the many challenges that come with it, and in the process begin to take their place as young adults in the family. Visit the film's website. Indigenous Languages and Technology (ILAT) discussion list is an open forum for community language specialists, linguists, scholars, and students to discuss issues relating to the uses of technology in language revitalization efforts.